then select the “App for SharePoint” template. Give the name as “MSPProviderHostedDemo”. Give the url of your sharepoint site. (Here I am giving my sharepoint online site url). And select the option Provider Hosted as we are dealing with provider hosted in this demo. Say Next. In next screen elect Aspnet/mvc. Here iam going with asp.net web forms appn for this demo. In Next screen, this is something important to know. See the below screen. Here we have two options to authenticate our app with the site. Windows Azure Access Control Service – This is also called as ACS or low trust hosting type. Basically this will be used when the appwebsite is hosted in azure. In our case we will be using this. Use a Certificate – This is also called as High Trust/ Server to server authentication model. Here the appwebsite is hosted on to a IIS website in a server instead in azure. The handshake between the app and the website is done by the certificate. Say Finish. For more details, refer authentication and hosting techniques from msdn. So now our solution structure will be like this. It contains two projects. AppProject and AppWebProject like below. 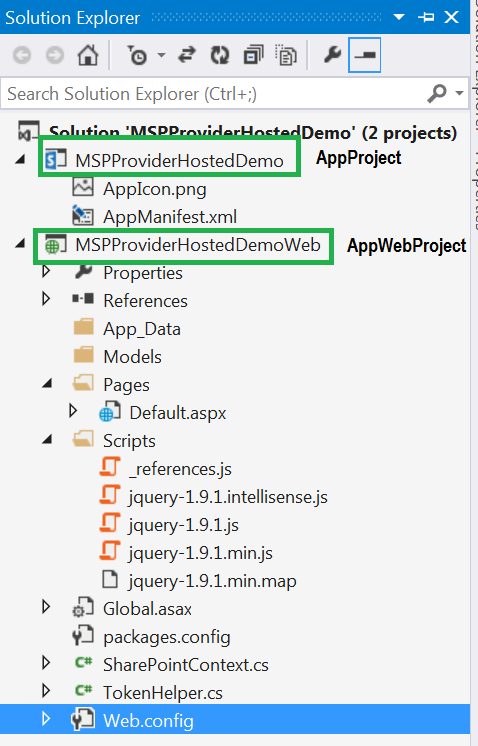 Once you build the AppProject, itwill give the .app file(like .wsp for our sp solutions). We will publish this file to sharepoint site. 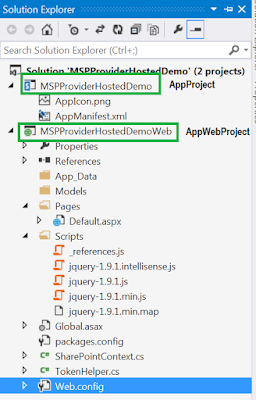 The appwebproject , we will deploy/host/publish this appwebproject to azure website. Refer Part3 for the continuation..